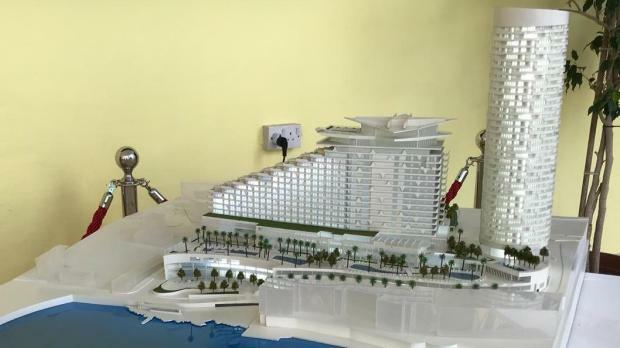 The Planning Authority has decided on the db Group’s controversial proposed 38-storey tower and 17-storey hotel at the Institute of Tourism Studies (ITS) site in St George’s Bay. The project was approved despite unprecedented opposition from local councils, residents and environmental groups. Follow updates as they happened. 3.37pm: To cheers from half the room, and cries of "shame" from the other half, the application is approved by 10 votes to 4. In favour: Government representative Clayton Bartolo, ERA chairman Victor Axiak, deputy chair Elizabeth Ellul, Desiree Cassar, Timothy Gambin, Matthew Pace, Simone Mousu’, Jacqueline Gili, Ivan Tabone, Joseph Brincat. 3.35pm: Mayor Dean Hili will also vote against, as expected. Construction alone, he says, will condemn residents to years of inconvenience. His other reasons are already public, he says. 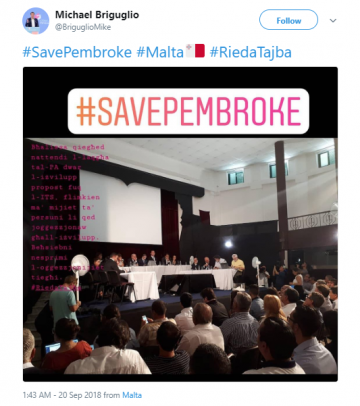 PN representative Marthese Portelli and NGO representative Annick Bonello are also against. 3.32pm: Since the recommendation is to grant, members who intend to reject the project are being asked to state their reasons. Chairman Vince Cassar states that he will vote against on consistency grounds due to the lack of a masterplan for the area, as well as concerns over the Grade II scheduled building and the "excessive design". 3.30pm: We are moving into the voting procedure. 3.25pm: The mayor insists the council is in complete disagreement with the developers' traffic plans. 3.20pm: No uncertainty from Pembroke mayor Dean Hili, who has already declared that he will vote against. He says his position is public, so he will instead focus on mitigation measures that should be imposed if the project is approved. The tunnel is his major concern: given the vague letter of commitment, he asks what will happen if it is never realized. Developers respond that there are alternative infrastructural measures that could be carried out if there are delays with the tunnel. 3.15pm: Although Adrian Delia said on Tuesday he expected her to vote against the project on policy grounds, it's certainly sounding here like Portelli is satisfied with the answers she has received on her policy questions. Now she requests an assurance that the substantial planning gain proposed - nearly €1.5 million - will not be used to build the tunnel. PA CEO Johann Buttigieg confirms that this would not be allowed. 3.10pm: The Opposition representative takes aim at the 'letter of commitment' over the tunnel. "It is deeply irresponsible of the government, on a matter of such importance, to release such a vague letter that includes no details or timeframes." 3.05pm: Opposition representative Marthese Portelli (whose party leader Adrian Delia said this week was likely to vote against) again highlights the lack of masterplan and the long-overdue local plan reviews. This, she says, is creating uncertainty for everyone, including developers and residents. 3pm: Government representative Clayton Bartolo is speaking next: he says that while the lack of a Paceville masterplan is a concern, the applicant should not be punished as a result. He touches on the visual impact, but says only that it is positive that the developers' photomontages took into account the cumulative impact of other developments. He praises the Green Travel Plan and traffic management plans. 2.55pm: The ERA chairman is speaking highly positively about the environmental studies that have been carried out. He says the decision on whether to support the project should be based on whether any negative impacts can be adequately mitigated. Should he vote in favour, it would be extremely difficult for the 'no' camp to make up the numbers. 2.50pm: ERA chairman Victor Axiak notes the ecological concerns over the shadowing of the nearby Natura 2000 site, but downplays them: "The shadows cast onto the protected habitats and areas are minimal and not persistent. The Environmental Impact Assessment, one of the most detailed ever carried out, found various problems and environmental issues. With each of these issues, we investigated and we met with the EIA coordinators. In some cases, the development was altered as a result." 2.35pm: NGO representative Annick Bonello speaks next. Her primary concern appears to be the safety of Għar Ħarq Ħammiem, a massive underlying cave and Grade I scheduled site. The case officer insists all the necessary studies were carried out and that, with the appropriate mitigation measures, there are no risks to the cave. 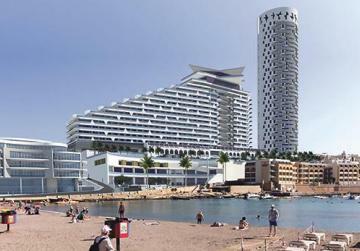 The architects say that the plans will be amended if any new risks are discovered during works. Concerns over shadowing and the area's ecology are also raised. 2.25pm: Chairman Vince Cassar objects to the dismantling and rebuilding of the Grade II scheduled ITS building: "With all due respect to those who assessed that this is acceptable, I cannot agree. We all know what happens during 'dismantling'." Next he highlights the lack of a development brief for part of the site, which the local plan says is required. The case officer responds that all that is built on that part of the site is underground parking, and that a future development brief is not being prejudiced. The chairman is unimpressed: "You're still prejudicing whatever the brief may say with respect to the underground area." To applause from objectors, he raises issues about the tunnel and parking issues. He silences the applause though. 2.20pm: Tunnel commitment: CEO Johann Buttigieg reads the 'letter of commitment' from government, a condition of the project. The brief letter, being made public for the first time, says the tunnel is a "government commitment" and that Infrastructure Malta will be the "vehicle for the design" of the tunnel. There are no further details. 2.15pm: On the beach concession, the case officer stresses that all interventions will be temporary and reversible, and therefore in line with planning policy. We are now onto the board discussion, which will be followed by the vote. 2.05pm: Project architect: "The area was designated as appropriate for high-rise buildings in the Floor Area Ratio Policy four years ago and the public was consulted when that policy was drawn up. So you can't come here today and argue that the area isn't suitable. We've moved the project as far from the Residential Priority Area as we can. We can't do more than that." 2.02pm: The developers' architect is defending the validity of the Social Impact Assessment - brought into question by objectors. He insists the study was carried out in consultation with qualified experts and in line with the PA's guidelines. An objector yells from the back that the study found massive opposition to the project. She is asked to be quiet. 2pm: We're back to the developers. Architect Jesmond Mugliett (a former transport minister) is defending the commitments made on transport issues: the Green Travel Plan, the provision of parking to serve the demand from Paceville - which he says is currently spilling into residential streets - and the tunnel plans. 1.50pm: We're slowly but surely reaching the end of the speakers' list. This will be followed by a response from the developers and then comments from the board members themselves, which will finally lead us to the vote. 1.45pm: Partit Demokratiku MP Godfrey Farrugia: "I cannot understand the rationale of the case officer in recommending this project for approval when there are at least 12 infringements of policy and procedure." He highlights the lack of development brief, the Auditor-General's probe into the land transfer, the visual impact, the uncertainty surrounding the promised tunnel, and the lack of a national master-plan to assess the "real demand" for such developments. 1.35pm: Chairman Vince Cassar is keeping a tight leash on proceedings: now he instructs a resident to put away a banner he has unfurled, showing the slogan "Don't bury us alive". To the chairman's credit, the meeting has proceeded largely without incident. 1.30pm: Moviment Graffitti's Andre Callus, who the PA board are by now well-acquainted with, dismisses the project's support in the hall as rent-a-crowd tactics: "Maltese developers are so unimaginative," he says. "We've seen these tactics before. Today, we saw vans being loaded up in Mellieha to bring supporters here, but the developers' own Social Impact Assessment shows that most of the area's residents don't want this project." He raises questions about the tunnel: "If the project is approved on the basis of a tunnel, needed for the project to function, which may or may not be approved, it means either that we're risking the project not functioning, or that a decision on the tunnel has already been taken in secret." 1.25pm: Lawyer Claire Bonello from eNGO Flimkien Ghal Ambjent Ahjar raises questions about the proposed "beach lido". The local plan, she says, rules out beach concessions because of the already-major limitations on public coastal access in the area. She asks how the lido can be classed as public. 1.20pm: It's splitting down the middle now: objectors are highlighting the impact on their quality of life, while others say the project will benefit the area, and claiming it has been singled out for unfair criticism and negative press. 1.15pm: A resident of Triq Walter Ganado, adjacent to the site, says the project will be "one of the most beautiful in Malta" and urges approval "for us, for our children, and for the economy to grow". Growing heated amidst jeers from objectors, he launches into a tirade against the local council for letting the area slip into neglect. "This project will make Pembroke the envy of the world." 1.13pm: We've had the first comment in support of the project. A man identifying himself as a former Pembroke mayor says the 4,000 objectors are not Pembroke residents. He insists the development is in line with the laws of the country and should be approved. 1.10pm: Things are moving quicker now, and so far very civilly. 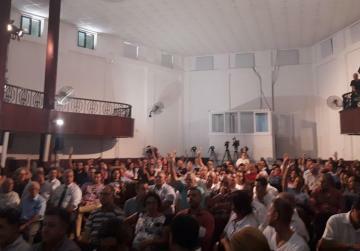 Some points that have been raised along the way: PN local councillor Michael Briguglio, a sociologist, has challenged the scientific validity of the Social Impact Assessment. Another objector brings up the tunnel, insisting that a promised letter of commitment from the government (one of Transport Malta's conditions) should be published before any approval is given. 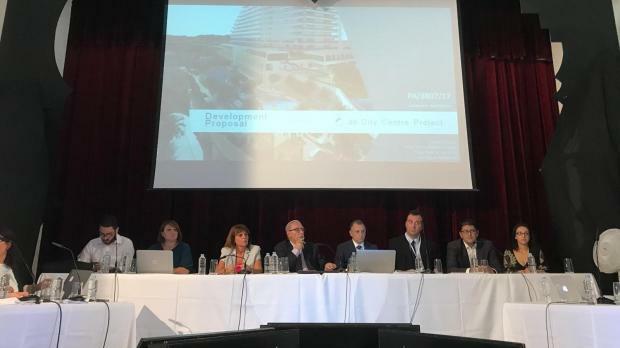 1.07pm: Swieqi mayor Noel Muscat: "These presentations have been so poor that they've only convinced me further that this project will have no benefit to the community and only make matters worse. This is the wrong project in the wrong place with the wrong size, and it is going to have a negative effect on all human beings in Malta." 1.05pm: Alternattiva Demokratika's Arnold Cassola says there have been suspicions of illegality throughout the process, referring to the valuation of the land transfer from government to developer. He says the EU group has raised these questions at EU level, and the European Commission is expected to give an opinion soon - which could include issues of hidden state aid. "Do you want to be responsible for this decision while doubts remain over whether it is even legal?" he asks. Chairman Vince Cassar reminds him that the planning process is independent of issues like this. 1pm: Nationalist district MP Karol Aquilina slams the project as "monstrous". He questions why residents' wellbeing has barely been mentioned in the hearing so far, and urges the board not to give in to "bullying" by the developers. 12.55pm: St Julian's deputy mayor Albert Buttigieg is the first to speak: "We were once meant to have a masterplan for Paceville. It was meant to include Mercury House, Villa Rosa, City Centre. Mercury House has been approved, Villa Rosa has been approved and now City Centre may be approved. Doesn't it occur to you that instead of the door, they're coming in through the window?" Buttigieg says the three surrounding local councils represent 30,000 people, speaking with one voice against the project. "If you believe in democracy," he tells the board, "you have one option." 12.50pm: The chairman asks for a list of those wishing to speak: hands shoot into the air across the room. There's some sitting MPs, representatives of NGOs and local councils, residents. Remember there were more than 4,000 objections to this project, but expect some supporting voices to have been rustled up too. We are going to have 25 speakers. 12.40pm: Other aspects of the high-rise policy are also ruled to have been satisfied. There's a neat little workaround on the requirement for the site to be surrounded by four streets: as with other similar project, the developers have included "virtual roads" to meet this criterion. We're approaching the end of the case officer's report now - he confirms his recommendation in favour of the project, with a bank guarantee of around €500,000 and a planning gain of nearly €1.5 million. We'll be hearing from the public next. Expect it to get heated. 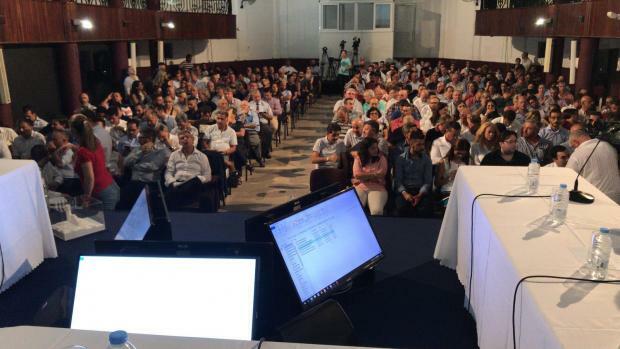 12.30pm: While this has no bearing on the application, there is no air-conditioning in the hall - where some 400 of us are packed in - and a constant chorus of grumbles about the lack of air-conditioning in the hall. 12.27pm: We've gone into a technical discussion of the Floor-Area Ratio Policy, which governs high-rise developments. In a nutshell, the policy sets requirements on the amount of public space at ground level. What you need to know is the case officer concludes there's enough of this: a public plaza and covered walkway close to the tower, and a larger plaza, about a third the size of a football pitch, by the hotel. 12.15pm: Case officer notes that, according to the ERA, the project's environmental impacts can be effectively mitigated. But the environment authority, whose chairman has a vote on the board, isn't entirely happy: it warned of the lack of an overall plan for the area and the cumulative impact of all these developments. 12.05pm: It's easy to forget the Institute of Tourism Studies building has Grade 2 scheduling protection. It will be dismantled and rebuilt to be integrated into the new project. The case officer says the cultural heritage watchdog found this acceptable. The watchdog also assessed the threat to Għar Ħarq Ħammiem: with only very limited excavations above the cave, the authorities are satisfied. 11.57am: What about the design? The case officer says the Design Advisory Committee first indicated the project's scale was excessive given its surroundings, and would have a highly adverse impact. But after the developers' revisions - about eight metres off the tower, a floor from the hotel and other changes - these concerns appear to have been dropped. 11.50am: The case officer references the 4,000-plus objections that have been submitted and the objections of the Pembroke and St Julian's local councils. Significant here is the conclusion that while the surrounding area is residential, it is not, as the local councils said, a "residential priority area" as defined by planning policy. This matters because the high-rise policy specifically rules out projects in these areas. The case officer points out that there were no objections from the consulting bodies - transport, cultural heritage, infrastructure and others. 11.40am: We're still going with the studies. There's a Green Travel Plan to minimise traffic, a cultural heritage report, and perhaps most significantly, a shadowing study, another sore point for residents. And with that, we move on to a presentation by the PA case officer. He has recommended that the project be approved, and he's now walking through his assessment. 11.30am: There's a lot of published studies to be presented - hydrology, geomorphology, air quality, noise, vibrations - and we're very slowly making our way through the lot. 11.20am: There's ironic cheers from residents in the hall as the consultants who carried out the environmental studies show photomontages of the development. The scale and visual impact are a major issue, particularly as the surrounding area is largely made up of residential two- and three-storey buildings. The published studies concluded a "highly adverse" visual impact. 11.10am: Now for the traffic studies. All this hinges on a tunnel planned to be built to cope with the added demand. The tunnel will skirt Pembroke all the way up to the junction with Triq Suffolk, close to High Ridge. The junction itself will get a major upgrade. But all this will have to be dealt with in a separate application, if this one is approved. 10.55am: Now the architect explains the Social Impact Assessment: 400 people surveyed by phone, four random focus groups in the community, and one-to-one meetings with prominent personalities. The result? A reduction of hotel rooms from 464 to 438, the removal of a planned wedding hall, and a slight reduction in the heights of the tower and hotel, apart from new traffic mitigation measures, public spaces and CSR commitments. Objectors have raised concerns over nearly all of these issues in the last few days, so expect more on this as the meeting goes on. 10.50am: The project architect touches on another sensitive point: the development is directly above Għar Ħarq Ħammiem, the largest underground cave in Malta. The architect says only a public plaza will be placed above the cave, minimising excavation and construction which could threaten its stability. It's worth pointing out that environmental studies have also found very little risk to the cave if the right measures are taken. 10.45am: A lot of focus is going to be on the public open spaces. This is important because under the high-rise policy, at least half of the space at ground-floor level must be public. One of the project architects is now explaining the technical elements of this space - around 5,000 square metres - and mostly spread over two areas here referred to as "San Gorg Plaza" and "Tower Plaza". Meanwhile, the last member of the PA board has arrived - we're at the full 14 now. 10.35am: Architects from the design firm explain the ideas of simplicity and clean shapes that inspired the design. The project includes two public plazas, which they describe as a vibrant, dynamic space facing the sea, and a more urban, residential square on the Pembroke side. Architects also highlight the "hanging gardens" facing the sea and the tower's green facade, which they say give a natural appearance and sense of continuity. 10.25am: We are first hearing a presentation by the developers. One of the project architects explains how five design firms were assigned to present alternative proposals for a "landmark building" on site before Italian firm MYGG was chosen - the current design. 10.21am: Chairman Vince Cassar gets the meeting underway with a stern warning to those in attendance: "Remember that I have the right by law to kick everyone out if there are any disruptions". The PA is not taking any chances after the rowdy protests that derailed last week's fuel station hearing. 10.20am: The hearing will be kicking off soon. The board will hear submissions from the developers and from the PA's case officers before opening the floor to the public, including the mass of objectors who have gathered. Most of the 14-member board is present: only Jacqueline Gili, one of the government's appointees, is missing.